Where can you go to learn how to properly vent an attic fan or install recessed can lights with adequate insulation? How about practicing blown-in insulation and combustion safety in a mock home? 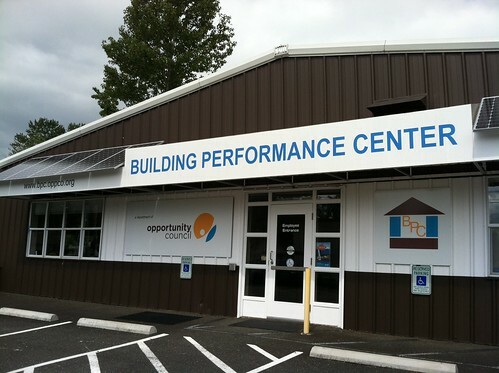 These measures and more are available at the Building Performance Center operated by the Opportunity Council in Bellingham, WA. The Building Performance Center (BPC) trains and works with contractors, weatherization professionals, building owners and program managers to make buildings healthier and more energy efficient. The new facility, funded by American Recovery and Reinvestment Act (ARRA) funds, is a hands-on education and training center hosting regular trainings in everything from Lead-safe Wx to BPI Certification. John Davies, Director of the BPC said, "We have learned the importance of getting the details right in residential energy efficiency retrofit work. The BPC training facility is designed to provide realistic, hands on opportunities to use the equipment, materials and methods that achieve superior results. BPC's instructors have worked at all levels of the Home Performance Industry and are committed to building a well trained work force. Our trainings provide the knowledge and skills to reduce energy use in homes while ensuring health, safety and durability". 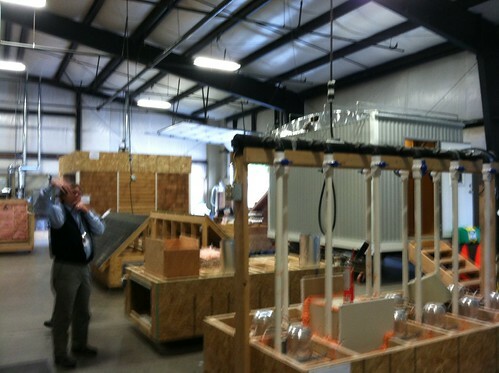 On Thursday, May 24, utilities and other stakeholders gathered at the facility for an open house, tour and discussion. Joel Eisenberg, of Oak Ridge National Lab, spoke from the National perspective regarding developing a trained, credentialed workforce. Shawn Collins, Opportunity Council Program Manager, discussed lessons learned of the Community Energy Challenge in Whatcom County http://www.communityenergychallenge.org/. Visit www.buildingperformancecenter.org for more information, including their training schedule and upcoming events. That's cool. I wonder how many of these there are in the Northwest. Anyone else know of something like this? Wow. Wish we could have a BPC in every big town -- what a great idea! I hope they'll also do trainings for ambitious homeowners. In Portland we have the Community Energy Project, a non-profit that "empowers people to maintain healthier, more livable homes, control their utility costs, and conserve natural resources. [They] do this through education, hands-on training, and distribution of weatherization, water conservation, and lead poisoning prevention materials." They get funding from city and local utilities, among other funding sources. Maybe we can get a list started here of other such organizations/programs.